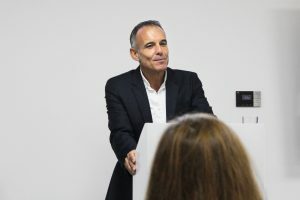 Local businesses gathered at Bedford Heights on Wednesday, 26 September to listen to the building’s owner, Tim Pain, share his 12 rules of business and life. Tim, whose successful property development business includes a portfolio of properties across the UK, was invited to speak at the first Drive meeting in its new home at Bedford Heights, where monthly meetings will continue to be held. Tim encouraged the audience to always act with integrity and be the best they can be as they grow their businesses, and illustrated his talk with stories of the inspiring people who have mentored him along the way. 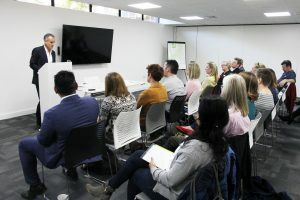 Tim Pain, Managing Director of Verve Developments Ltd, said: “I’ve been in business a long time but must admit when I was first asked to speak at the Drive event at Bedford Heights I did wonder what advice I could share with other business owners. When it came to writing my talk, I realised there are 12 clear rules which have dominated my career and which also filter into my personal life, and which I believe have helped me create a successful business. Bedford Heights was built by Texas Instruments in 1960. The building was installed with a cyclone proof roof, being a blue print lifted from the Texas Headquarters – at that time in Dallas. In 1999 the building was converted into fully managed office spaces, but until recently was still known locally as ‘the old Texas Instruments building’. Tim’s company has transformed the buildings into a office space and a modern conference venue including a courtyard cafe, midcentury lounge and impressive reception. Drive, the Partnership Network is a group for business owners who meet once a month at Bedford Heights to learn from other business owners about how to grow a business that gives them a great life as well as a great living. It was encouraging to hear that in his very busy life, Tim always makes time for his family, goes to the theatre every week and always makes time to stay fit. Next month’s Drive meeting on 18 October features Andy Boothman who, after 20 years building a successful branding business, took a chance on manufacturing an exclusive range of garments and found that both business started to feed each other. To find out more about Drive and to book for the next meeting visit www.drivethenetwork.com.